The days following the Italian parliamentary elections of 4 March 2018 were marked by alarmist headlines in the German and international press. Some of them even longed for the former Prime Minister Berlusconi, who was hitherto infamous as an enfant terrible of Italian politics. However, the election outcome is not surprising given the changing attitude of the Italian electorate towards the European Union: it reflects the dissatisfaction with the economic situation, the call for more freedom for national governments and a social Europe, which was long time underestimated by Brussels. 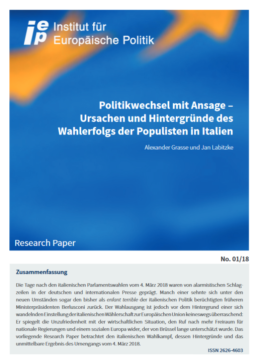 In this research paper, Prof. Dr. Alexander Grasse and Dr. Jan Labitzke, Institute for Political Science of the Justus Liebig University Giessen and network “Politische Italienforschung” (pifo.eu), analyze the Italian election campaign, its background and the results of the poll of 4 March 2018.